Is there an entry fee for the centre? When and where can I see the wildflowers? Malleefowl (Leipoa ocellata) are large ground dwelling birds somewhat larger than a domestic hen. They belong to a family of 22 bird species known as “megapodes”(meaning big feet). Described as a ground dwelling bird, Malleefowl will take flight to roost in trees overnight and to escape immediate danger. Malleefowl are unique to the arid and semi-arid regions of Australia. Megapode habitat is generally described as high rainfall tropical/subtropical (east and north coasts of Australia, New Guinea, Philippines, Indonesia and Western Pacific/Southern Indian Islands) however the Malleefowl differs from other megapodes as a species of the lower rainfall Southern Australian landscapes. Once common, their numbers have seriously declined over the last 100 years. Malleefowl are classified as “fauna that is rare or likely to become extinct” under the Western Australian Wildlife Conservation Act 1950-91. Nationally, the Malleefowl is listed as a threatened species in need of national conservation efforts (National Recovery Plan for Malleefowl, Dr Joe Benshemesh 2000). 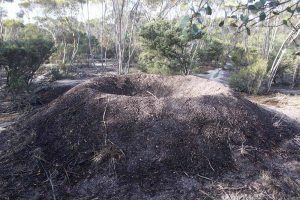 The malleefowl’s very distinctive nest or mound.